Beware unsolicited emails and phone calls; they may be scams. Scammers usually contact you out of the blue and they can be very convincing, making use of every channel of communication – emails, SMS, snail mail or even phone calls just to steal money or information from you. 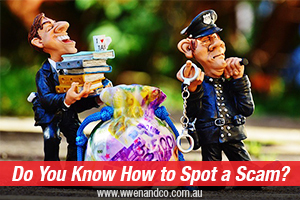 To help you avoid being scammed we want to share with you how to spot the common characteristics of a scam. What do I need to do if I think someone is trying to scam me? call the ATO dedicated scam reporting line 1800 008 540 between 8am–6pm EST, Monday to Friday. If a scammer or someone claims that he/she is from ATO has contacted you or your client and you are unsure if they are legitimate, report it to ATO right away. Please visit this link to check how to contact ATO.